On my lazy days I love staying in bed--with something fabulous to eat--and catching up on cooking shows I dvr'd over the week. This week I caught up on a repeat of Man v. Food on the Travel channel. On this episode Adam returns to his hometown of Brooklyn. I must say he visited a few interesting places like a restaurant specializing in "suicide" wings and a pizza shop with a delicious looking Sicilian style pizza. However, the one that really rattled my taste buds was Brennan & Carr a pub offering roast beef sandwiches dipped in beef broth! Adam explains that you could have the sandwich one of two ways: either with the roast beef dipped in the broth or two, with both the bread and beef dipped into the beef broth. This sounded way too good! So this weekend Alex and I went on a mini "road trip" to Brooklyn and visited Brennan & Carr to indulge in a delicious looking roast beef sandwich. To my surprise the prices were inexpensive, with the classic roast beef sandwich costing less than $6! We ordered soda, French fries and of course two sandwiches, mine regular (meat only dipped) and Alex "double-dipped." When it all arrived I was in heaven. The roll was soft and the meat moist. The sandwich is quite simple, but the beef broth takes it over the top! So much so I asked Alex to ask for broth on the side as I wanted to control how much of my sandwich I submerged into that delicious beefy flavor. Within minutes I was done and satisfied. Alex then asked his usual question: Would you come back? To which I replied, Yes, in a heartbeat! I plan on visiting other gems featured on Man v. Food, but for now you should head out to Brooklyn for a mouthwatering sandwich at Brennan & Carr! Hope to see you there! In this world they are two types of girls: those who get together with girlfriends for lunch and refuse to eat and those like me—girls who get together with girlfriends for lunch and know how to indulge. I am by no means saying we overindulge. I am just saying we aren’t ashamed or afraid to get together over a few dishes of food. For a foodie like myself, I am so happy to have these types of girlfriends! Today the three of us met up at Five Points Restaurant. While this restaurant has been featured in Time Out NY and New York magazine, what brought us in was an episode of The Best Thing I Ever Ate on Food Network. 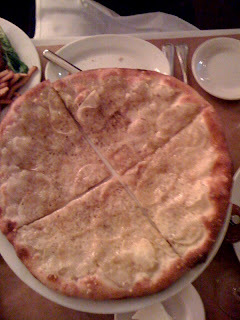 Chef Alexandra Guarnaschelli raved about Five Points’ Wood Oven Pizzette. What's that? It’s thinly sliced Yukon gold potatoes, fontina cheese & truffle oil “pizza”. Mouth watering yet? Figured so, that's exactly why we went to check it out for ourselves! Naturally we needed more dishes to accompany the pizzette, so we ordered the Char-Grilled Grass Fed Burger and the Beer Battered Fish Tacos. All the dishes looked remarkable. We eargerly asked the waiter to place the dishes in the middle so the three of us could feast! It was unanimous, the pizzette was the favorite! But at the very least we were able to taste other menu items, split the bill which made it economical and lastly, got the opportunity to catch up on each other’s lives. Now that's what I call a great power lunch with girlfriends!